Leslie Tiesler is accused of starving three adopted sons, aged 13 and 14, shooting them with a BB gun, beating them with a spoon, and confining them to a tool chest for days. 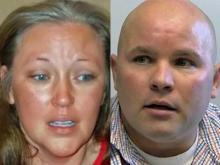 The other two children in the home, one biological, were not abused. Leslie’s ex-husband, Brad Thills, adopted the four children in 2008, but the children continued to live with Leslie while Brad was deployed, and it was in her care that the alleged abuse took place. The children are now in foster care and Brad has been charged as an accomplice in the abuse; he maintains that he had no idea how the children were treated while he was deployed and that he returned home to find them in miserable conditions. The children’s plight was not noticed because Leslie was homeschooling them. A month and a half after removal from the home, the 3 abused boys, who had been systematically starved for at least 14 months and were emaciated when removed from the home, had gained 27, 20 and 10 pounds.